For more than twenty years the beas group AG has been solution partner for medium-sized manufacturing enterprises. Since 2002, the company whose headquarters are located in Switzerland, has been focusing on the ERP system SAP Business One and on the development and marketing of industry solutions for the manufacturing and supply industry. Thus they have become one of the leading international SAP Solution Partners. beas' comprehensive solution provides quick and easy access to all company information and to those reports and documents that are needed for the decision-making in all departments of a company: Marketing, purchasing, accounts, production. The be.as industry solutions consist of several modules that are tailored to the individual needs of the customers. The module APS (Advanced Planning and Scheduling) is used for fine tuning when order times, processing times, transitional periods, capacity utilization, availability of resources and dates are crucial parameters in the value-added process. 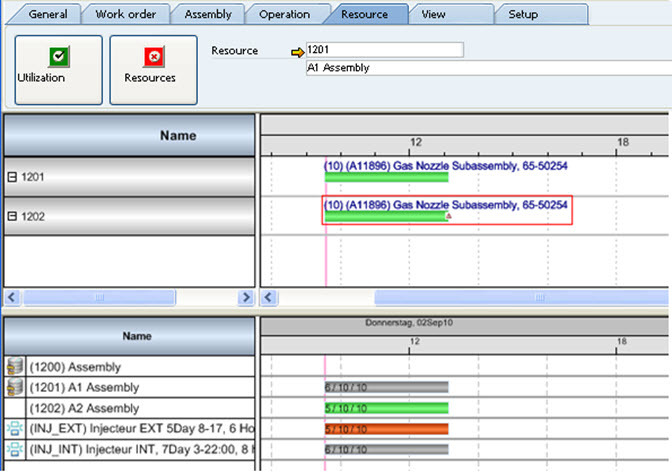 Here, beas uses a Gantt chart to compare the schedule-relevant activities to the required resources. The visualization that is realized with VARCHART XGantt ActiveX allows the transparent representation of highly complex data structures with a high number of dependencies. Even large amounts of data can be handled without problems. "The communication between NETRONIC Software und beas went smoothly right from the start. The construction of a first version in a Powerbuilder environment was completed within four weeks. All requirements, amongst others the multilingual interface, could be fulfilled in no time by using the ActiveX control. Due to the very detailed documentation we seldom had to contact the NETRONIC support. If we needed help, however, the support responded quickly and in a professional way", says Martin Heigl, development manager of the beas group AG. Encouraged by the positive experience, the beas group AG will continue to use VARCHART for their planning visualizations.